After being blown away by the awesomeness that was Pawn last year, I was a bit nervous about whether or not the sequel would really be as good as the first. Luckily, Captive was just as epic! I was honestly shocked by some of the amazing twists. The only con is that I found myself a little more annoyed with Kitty than I did in the first book. In Pawn, I was amused by Kitty and connected to her character a lot. But in Captive, she just didn't click for me. She is a good character in that she's independent and shows maturity. Yet I was frustrated because at every turn, she does something that hurts else. It felt like she was constantly trying to be proactive and help, but she just made things worse! That bothered me somewhat. But aside from that, this book was so much fun (and it gave me a lot of feels, just FYI!). Admittedly, it does start out slightly slow, but about a third of the way there's a major scene that makes you go, "WHAT?!" and from then on, it's literally impossible to put down. And there are many more twists to come throughout the book. So many things about the rebellion, Lila, etc. are revealed. I was really pleased because this sequel expanded thoroughly on things mentioned in the first book. 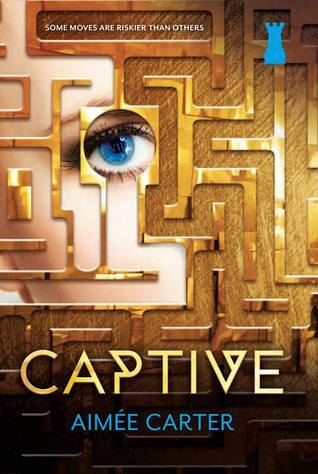 Overall, Captive was amazing. Yay for sequels that increase character growth, have complex storylines, and delve deeper into world-building! I did get a little irritated with Kitty's character at times, but really, that is the only flaw. I can't wait to see how it all goes down in the last book!